SARANAC LAKE — At the Left Bank Cafe, two J-1 visa workers from France are wrapping up their time in the United States, where they have lived, worked and learned for the past couple of months. 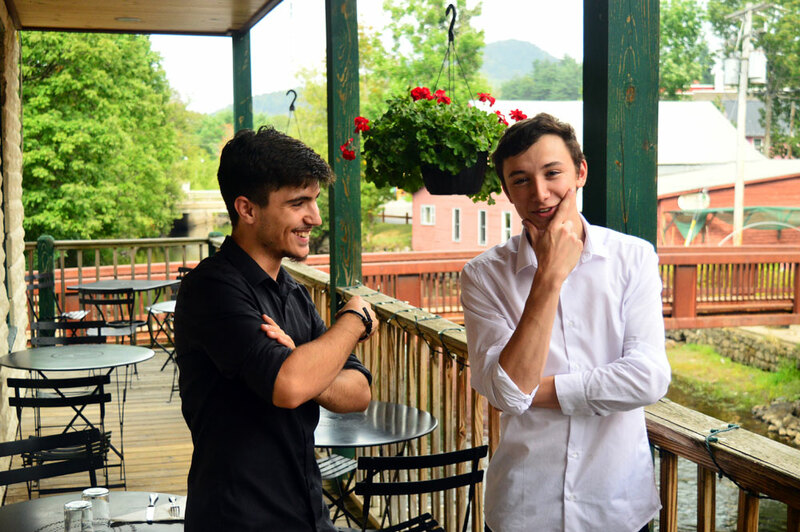 Colin Chartreux and Joachim Grandin, both 19, cleared tables and served drinks Tuesday afternoon at the cafe, speaking in French with owner Anne Sterling and looking at photos from Chartreux’s hometown, Saranac Lake’s French sister city: Entrains-sur-Nohain. In 1989, Kenneth Weissberg, who grew up with American parents in Entrains and the Adirondacks, forged a relationship between the two cities. Entrains deputy mayor Jean Louis Allen and Saranac Lake’s mayor at the time, Bill Madden, made the kinship official by exchanging keys to their municipalities. Weissberg now owns the Left Bank Cafe and splits his time between France and Saranac Lake, like in his childhood. Sterling keeps a photo in the cafe of the “Maison Des Adirondacks,” or the “House of the Adirondacks,” a brick building in Entrains built around 1400. In Adirondack fashion, its name appears on the front in letters made from tree branches. Both Chartreux and Grandin have family who know Adirondackers involved in the sister city program. The young men applied for J-1 visas to work at the cafe in their summer between high school and college. There are many J-1 visa student workers in the Adirondacks, coming from all corners of the world and doing all sorts of work. Around the Tri-Lakes area, most work at the many hotels and restaurants. Chartreux and Grandin said the opportunities the visa granted them have been nice, but the process of applying was long and complicated. Chartreux was supposed to arrive in early June, around when Grandin did, but stalled paperwork pushed his arrival date well into July. He said obtaining a J-1 visa is a long process of signing papers and mailing them to the embassy, receiving more paperwork, signing that and mailing it to the embassy, and so on. Chartreux had the additional obstacle of paperwork errors. The two are staying in an apartment above T.F. Finnigan’s men’s clothing store, where they proudly hung their home country’s flag as France won the World Cup championship against Croatia in July. They have been all around Saranac Lake, playing basketball, taking in the views from the summit of Baker Mountain and getting ice cream — a French invention — from Stewart’s Shops. Grandin, who was here around two months more than Chartreux, even visited Montreal and Baltimore. Grandin said seeing American life with his own eyes colored his expectations about the country, adding depth and wisdom to his ideas about U.S. culture. He was interested by the level of political involvement in average people, something he said in France is a less universal conversation piece. “The fact that everyone is more implicated in the political life, somehow it’s nice because it shows that everybody cares about the country,” Grandin said. Chartreux will work at the cafe until Sept. 7, when he will return to France to attend business school. Grandin will follow around 10 days later on his way to college.